I added a twitter feed for Janmade, its on the right side of the page under the link to my etsy shop. I also lowered all the prices in my etsy shop to 8.00 so if you are interested in a tie dye baby onesie or some soft soled shoes come and get it! I would like to clear out some of these items before I add new items to the shop. For anyone reading this, you can get any 4 items in my shop for 28.00 if you mention “RAINBOW” in the comments section when you purchase. I will make the adjustment in Paypal after the sale. Happy Shopping and thank you for reading! I spent this weekend doing trial and error with some baby shoes and bibs. I was trying to figure out sizes and the design of the bibs and shoes I wanted to make. There are so many different kinds different crafters have made and shared online, I took what I liked from them and tried to do what I thought was best. These shoes were the 3rd draft, I liked how they turned out. I used some black polka dot fabric that I got from the sew mama sew fat quarter swap, and some non skid nubby fleece for the soles. I was able to get 2 pairs of shoes out of one fat quarter! It is a good project for that size fabric. The bib was my first draft. I think turned out adorable, but I am still wondering if it is too small. Its hard for me to judge, because all baby stuff is tiny, and I didn’t have a baby handy to measure. I went with some rough estimates based on other bibs that I have seen online. It has a little pocket in the front to catch crumbs or drool or whatever. 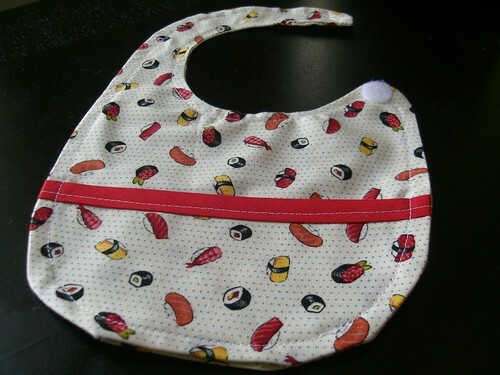 I love this sushi fabric, and I think the cute food themed fabric is perfect for bibs. I also decided I need to use a strip of velcro on the back of the bib to make it more adjustable than just using two dots of velcro and to leave the opening to turn the bib on the side, not the bottom, because it is really noticeable on the bottom of the curve. These were my first tries, and I’m pretty happy with the results, and I definitely learned what I need to change to improve the end results. So here is the first draft of my banner and avatar for my soon to be open etsy shop, courtesy of my friend Christine. I absolutely love it! The only thing that I asked to change was to make it green instead of blue, since green is my favorite color. Other than that, I think its totally perfect. I think I will use it for my blog as well. I can’t wait! Here is the avatar she made for me as well. So what do you think? I’d love some feedback. I also purchased some custom woven fabric labels from namemaker.com. They are going to take 4-6 weeks to arrive but I cannot wait to see them in person. I still need to make up some business cards so if anyone has any links or advice, that would be so appreciated. I can’t wait to hear what everyone thinks, I am so excited about my new business venture.